Master Segt. Keith Caraway answers questions about his service in the Army from curious Tonasket Elementary School students during a Veterans Day assembly Wednesday, Nov. 7. Tonasket Elementary School first grade students march and wave flags as they sing to veterans and residents at Wednesday's Veterans Day assembly. TONASKET – Master Sgt. Keith Caraway kept students of all ages entertained as he spoke about his nearly 20 years in the service at the Tonasket Elementary School Veterans Day assembly Wednesday, Nov. 7. The students were excited to ask him a lot of questions, including why he joined the military and what his favorite duty station was. Caraway joined the Army in June of 1999, as an Aviation Operations Specialist with responsibilities ranging from airfield management to airfield facilities and communication with the tower. Assignments included the Headquarters Company in Giebelstadt, Germany, and the Phoenix, Ariz., Recruiting Battalion before Caraway took on various positions within the 160th Special Operation Aviation Regiment (SOAR) from 2003 to 2016. Deployments included Operation Iraqi Freedom, Enduring Freedom and Operation Inherent Resolve, United Arab Emirates and Syria. He finished up his deployments with Syria in September 2017. Caraway received three Bronze Star Medals, three Meritorious Service Medals, four Army Commendation Medals, two Army Achievement Medals, an Afghanistan Campaign Medal, an Iraq Campaign Medal, Global War on Terrorism Expeditionary and Service Medals, and the Operation Inherent Resolve Campaign Medal. Caraway also earned the Master Aviation Badge, Basic Parachutist Badge and the Gold Recruiter Badge. Caraway served in every leadership position from Squad Leader to First Sergeant. 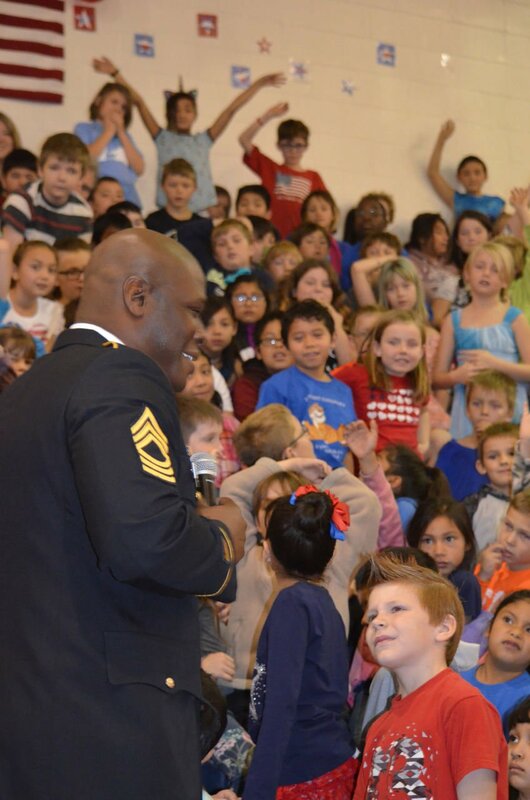 Asked by an elementary school student why he joined the military, Caraway responded candidly. “The second-best place was Germany, but there's no place like home,” said Caraway. Asked how many wars he fought in, Caraway said he served in Iraq and Afghanistan for 13 months. Asked what his favorite duty station was, Caraway said serving as a recruiter in Scottsdale, Ariz., as that was his home state. Caraway later said he was planning to retire from the military when his 20 years are up this summer. Caraway earned a Bachelor of Science in Management of Human Resources from Bellevue University, and a Master of Arts in Human Service Counseling from Liberty University. Caraway said he will be at Fort Lewis through April and enter a corporate fellowship program that runs from January through April, with the military helping him find employment in the outside world. His official retirement from the military is July 1. Asked what advice he would give kids thinking about joining the military, Caraway pondered the question for a long moment. Caraway also remarked on changes he'd seen over the years. As a “young kid,” especially, Caraway could certainly appreciate care packages sent to troops like the elementary school gathered up over the last few weeks. Caraway said John and Denise Dhane of Oroville, who he became friends with when they lived across from the base at Fort Lewis, hosted him for his visit here. Caraway then told students he was aware some of them had taken bags of chips from their lunches and put them in the soldiers' care packages. The visit to Tonasket for the Veterans Day Assembly also meant a lot to Caraway.